Bumper Stickers is rated 4.3 out of 5 by 8. Rated 1 out of 5 by KT113 from Very disappointed! When I received my stickers, they were very distorted and pixilated. I understand that may be because of the image but I wish the proof would have looked the way so I could have changed design. Rated 4 out of 5 by Anonymous from Great turnaround I bought stickers a week ago. Great quality and received in 2 days as promised. Only one issue with the print itself but nothing major. Will point out on my next order. Discover the next generation of vibrant, waterproof bumper stickers available at 48HourPrint.com. They look fantastic and have a huge advantage you’ll love: they’re repositionable and won’t leave behind messy residue. The woven fabric material is amazing. (If you tear it apart you can see fibers) but it prints beautifully, with vibrant color. The adhesive sticks to virtually any surface – and you can easily remove it, or reposition it (over and over again). We’ve run them through rigorous testing here in the 48HourPrint.com research lab, and have found them to be the best bumper sticker available today. You can also choose a vinyl material that is highly durable and waterproof. 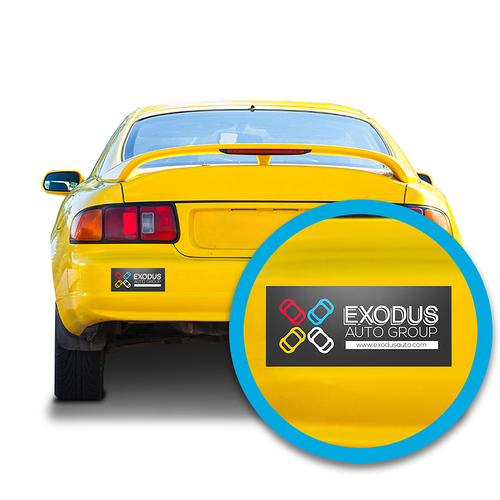 You can be confident that you are getting outstanding quality and value with our bumper sticker printing services. And you also get the peace of mind of our industry-leading 48-Hour Turnaround Guarantee on quantities up to 5,000. Our full-color bumper stickers can be printed in a range of sizes and in quantities of 25 to 5,000. Choose from one of our many sizes. All of our bumper stickers are printed with a UV Coating and a split-back liner for easy peeling and application. These bumper stickers can be applied to virtually any surface. Check out our bumper sticker templates for layout guidelines that will help keep your print job on schedule. The bumper sticker size you choose will play an important role. Small Stickers - Smaller sticker sizes like 3” x 3” are better suited for the rear window. At that level, people are able to appreciate your designs better. Standard Size - Stickers with a width of 10” and below are great for branding. The stickers are wide enough to accommodate a company logo as well as the company name. Wide Stickers - Stickers wider than 10” are perfect for a long block of text. This makes it ideal for sending a message. Whichever size you go with, rest assured that they will look fantastic.